Miniature orchid w i t h o u t leaves. 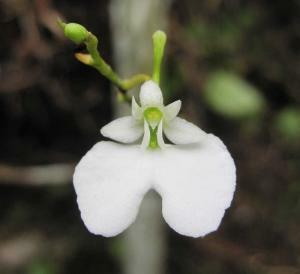 A netting of roots directly on a piece of wood, on which a small white orchid is growing on a fine shaft. Essence: Has a calming and centering effect, for the development of humility and modesty, helps to get along with less. On the physical level: For phamtom pain (amputated extremities) and pain with uncertain origin.